West Penn Minority Jr. 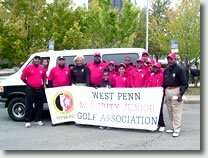 Golf Association, Inc (WPMJGA) is a tax-exempt 501(c)(3) junior golf organization whose mission is to use the game of golf as an instrument to educate youth. WPMJGA recognizes the many paths that can be taken to motivate Minority youth and youth in general to pursue both education and self-improvement. Some of these paths are and have been traditional, while some are innovative. WPMJGA has opted to use a non-traditional sport as an instrument to educate our youth in a manner that last a lifetime. As a stand alone junior golf program with almost 25 year, we are proud of the more than 300 participants that participated in our program. WPMJGA is seeking students interested in learning the game of golf, rules and etiquette. WPMJGA has been very successful teaching every aspect of the game. WPMJGA has taken from a non competitive to being able to compete in high level if a student's desired to play at that level. Please use the membership registration from to register and the program fee tab to pay. Schedule and additional information will be posted early in 2019. As one of the most unique and valuable recreational resources for youth in our region, we still need your continued support as we go forward fullfillig our mission. Please take a few minutes to navigate through our site to see how WPMJGA accomplishes the mission. Today, WPMGA has morphed into a program that is geared towards teaching kids that seek to play golf in high school, are playing in high school or currently playing in college. Interested participants may apply if the seek to learn and possibly play the game in high school and/or college. If you think your child meets the intent of the qualification above, please feel out the "contact us" with a note of interest. We are planning two camps this summer which will focus strickly on playing the game of game. If this interested, please contact us anytime!